(0:34) LUGGAGE SOUNDS: The sound of someone pulling luggage along the sidewalk. A suitcase is pulled along the street on its wheels. This sound effect is instantly delivered in CD quality WAV format via Paypal. A download link is automatically generated and sent to your registered Paypal email address when the transaction completes (preview contains a security watermark tone). This sound effect is instantly delivered. A download link is automatically generated and sent to your email address when the transaction completes. We are a highly verified merchant and we take great pride in our customer service. PREVIEW = Lo-Fi mp3 with pink tone security watermark (beep). This sound effect is offered for royalty-free use by https://www.tradebit.com For your one-time payment you will receive immediate download instructions to gain access to your file(s). If you would like more than one sound effect file please use the ´add to cart´ buttons. 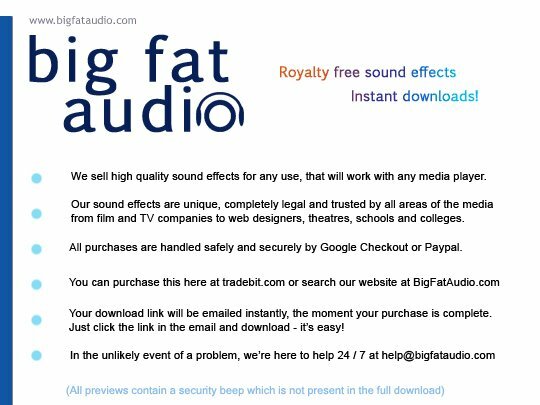 Once you have downloaded the sound effect(s) you can freely use and distribute the files inside your commercial multimedia projects such as film, TV, video, radio, theatre, Flash applications or website backgrounds etc. Mp3 Run With The Kittens - Cad Gold Jr.